AKIPRESS.COM - Mongolia’s capital, Ulaanbaatar, has been “invaded” by warriors – horseracers, archers and heavyweight wrestlers – who are moving around the city sporting their colorful outfits as they prepare to engage in the so-called “three manly sports” for the national holiday of Naadam, reports Latin American Herald Tribune. 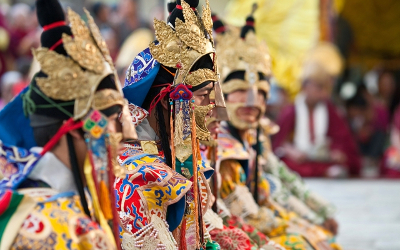 This is the time of year in this vast landlocked country when the Naadam festival is held, including competitions dating back to the time of Genghis Khan’s Mongol Empire around the year 1200 and events to commemorate Mongolia’s independence anniversary. Mongolian citizens woke up on Monday ready to welcome the horse-mounted soldiers with their colorful costumes and flags who entered the capital’s central square to officially inaugurate the festivities. Foreign tourists mixed with the locals wearing traditional dress in the soldiers’ procession from central Genghis Khan Square to the city’s stadium, where the festival and most of the sports events will take place. The “three manly sports” in the past had been limited to male competitors but now women may also take part in all sports except wrestling, and this year there are more athletes involved in Ulaanbaatar than in past years because festivals that had been held in other cities have been consolidated into one big event in the capital. Scheduled for the outskirts of the capital, surrounded by mountains, were the first horseraces of up to 30 kilometers in which some riders about 10 years old are participating, but the Mongolians say that it’s the quality of the animals that matters, not the age of the people riding them. Nevertheless, the keynote events of the festival are the heavyweight wrestling competitions, where two competitors in scanty clothing and fight without time limits or weight divisions until one or the other touches the ground with some part of his body that’s not a foot or a hand. “Mongolian wrestlers [are]... very respected, a symbol of strength,” one of the fighters, Sambuu Batjargal, said during a rest period prior to the battle.